God came to us through the birth of Christ - we come to Him through the cross. This holy week is ABOUT THE CROSS and Christ’s death and resurrection. By it we are bought back together and into full relationship with our Creator. A coach carefully puts a team together while mentoring each player into the best they can be. He prepares a team for play guiding them through the game and making necessary corrections to ensure the most effective play. He is there. He knows each player and develops their skill for the team’s sake. His sacrifices make it possible for a team to win. God does the same for us. He carefully teaches us how to be the best we can be by preparing us and guiding us through life. He is there. Sacrificing His only Son, Jesus Christ, on a cross turned out to be the great and final substitution for my sin and yours. It wasn’t the nails that held Jesus on that cross, it was God’s love for us. As a once-and-for-all pure sacrifice He carried our sins to the grave. The cross made it possible for us to be on the winning team…God’s! PRAYER: Thank you for the power of the cross. It brought me to you, allows me to know you and makes it possible for me to live my life for You. Help me to carry your cross into the lives of others. In your Son’s name, Amen. THE ONCE-AND-FOR-ALL CROSS...ONLY THE BEGINNING! In life there are certain pinnacles that we are privileged to reach. Whether it is a family goal, a job goal, a personal goal, a long-time-coming goal or an unexpected surprise event or circumstance, these carry us to a mountaintop of thrill and satisfaction. There is a passage of scripture that brings me to that pinnacle as I read and absorb its message. It is the 23rd Psalm....the PSALM OF PSALMS! The Lord is my Shepherd, I shall not want...You watch over me and meet all my needs. He leads me beside still waters...You take me to quietly refreshing places and speak to me there. He restores my soul...You re-ignite my life with your purpose. He leads me in the path of righteousness for His name sake...You guide me into right decisions for which I give you glory. Though I walk through the valley of the shadow of death I will fear no evil...when tough times come, even those accompanied by great loss, I will face them with strength and courage as I trust you. Your rod and your staff they comfort me...You will protect me and fight for me which brings me much-needed reassurance. You prepare a table before me in the presence of my enemies...Your table of blessings is spread out before me even when I’m with my adversaries. You anoint my head with oil; my cup runs over...I am covered with your favor from head to toe as you fill me with your spirit. Surely goodness and mercy shall follow me all the days of my life...Because of you, Lord, both good reports and overwhelming mercy will be my legacy. And I will dwell in the house of the Lord, forever...When I move out of this body, I will move into your presence and live with you in timeless wonder. MAY THIS PSALM OF PSALMS TAKE YOU TO LIFE’S GREATEST PINNACLE! Our heart is the center of control for our physical function. If it is interrupted all physical systems are affected and at risk. If it stops it ceases to provide life-giving blood to the body. A functioning heart allows us to SHINE in effervescent splendor – bright eyes to see the world around us, a viable voice to encourage others, strong arms to hold infants and sturdy legs to take us where we need to go. God shines His light of knowledge and wisdom into our hearts...the very soul of our being. He wants us to know Him, be in relationship with Him and be the face of Jesus on this earth. As His very essence shines into and through us, darkness becomes light. Through the disturbances of life, we can watch for the perfectly formed ripples that form as a result of them. As we pray through them, we look for the lessons learned and take hold of the assurance that this too will pass. There will be ripples of hope dancing in the sunlight of God’s love as we respond to our RIPPLES IN LIFE as God’s perfect plan for our lives. Ripples in the sunlight sparkle up the shore Of the muddy river, swollen by rains galore. Those splashing drops of water enhanced by sunny sky. 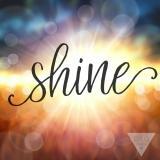 Think about God’s Son-shine rippling through our hearts. Pointing up to heaven...the Source where glory starts. ... DelRe..
OUR RIPPLES IN LIFE ARE GOD’S SPARKLING GEMS! Learning to drive a “stick shift” car was difficult. It involved the motion of both feet and both hands in order even get going. Then it required shifting to higher gears in order to run smoothly down the road. Speeding along was great but when a steep grade approached it was time to gear down allowing more control of the vehicle. When we come to the “steep grades” of life we need more power infused and less speedy activity. Jesus invites us to stop our constant striving and abide in Him...to power ourselves down in stillness before Him. Just as Jesus called the churning sea to be still, He calls out to us, “Quiet, be still before me.” We can POWER DOWN in undistracted stillness by putting our winds and waves in His hands. PRAYER: Today I choose to exchange my constant striving for undistracted stillness before you, Lord. Quietly and confidently I POWER DOWN, for I know you are my source and deliverer. It is in your Son's name I pray, Amen. ALLOW GOD’S POWER TO INVADE YOUR STILLNESS! Have you ever had a failed attempt at something and felt like giving up? I have. ..many times! ​One very impacting experience was learning to snow ski when I was 32 years old. Part of the process included multiple falls even on the easy Jack and Jill- type runs. There were times when I was convinced that becoming a confident, upright skier like those swooshing past me would never happen. Not only did I feel defeated but every muscle in my body screamed by the end of the day. On the third day of grueling failures and after completing the beginner’s skiing class, someone on the hill was once again helping me up. The simple directive given to me by this person was this: When you begin to fall, go with it…then get your skis under you again and go again. I learned a lesson that day, the sooner I was unafraid of failure the less falls I would take. Great advice and it worked! Following a game or competition, coaches spend hours “reviewing tape”. Often the players are also shown clips of game plays that were outstanding as well as those that need some work. The successful plays are exhilarating and enjoyable to review. But it is the failed attempts that become teaching tools and motivation for future success. As followers of Christ, we bear His name even in our failed attempts. He will pick us up and teach us how to handle life struggles. ERASING FAILURE is His goal. . .
Our response must be to learn through failure. When we are face down on the hills of life, remember to go with the fall for in the end our Savior is there to pick us up. He sends us forward in life with new understanding, new motivation, new confidence...FAILURE ERASED! ERASED FAILURES ARE GEMS IN THE CROWN OF LIFE! Sometimes things happen that clearly reveal the darkness around us. We recently had such an experience. With 2 big screen T.V.s missing after our household goods were transported, we contacted the moving company. The report of our concern was not well-received. Throughout 4 phone conversations they hung up on us, denied any responsibility, engaged in extreme efforts to intimidate us, and attacked our character with brutal and accusatory lies...a classic case of good versus evil. We had lit up a very dark place with the truth. It was not received. We knew we were not to enter that darkness. With a prayer for these people we have left it in God’s hands. It can be very difficult to let go when we have been wronged. Knowing that our mighty God sees all and will repay is both reassuring and restful. PRAYER: Thank you for being our forever advocate as we walk through the darkness of this world. Please help us to shine for you even in the darkest places. In Jesus’ Name I pray, Amen. We are each gifted with a place of power…power to decide, to accomplish and to effect change. Doors of opportunity are opened when power is used wisely. Power appropriately applied is rewarding both for the one who has it and for those around them. Applied out of rage or pride it can easily result in defeat, disgust and disillusionment. Athletes know that positioning themselves is key to a successful performance. Being in the right place at the right time has powerful results – great blocks, passes, goals and assists. Positioning ourselves in life is basic to a life worth living. PRAYER: I give myself to you, Lord...you are my POWER PLACE. Please accomplish in me that which you desire. Thank you for the power of your Holy Spirit who guides and leads me in wisdom and purpose. In Jesus’ Name I pray, Amen. THE PLACE TO GAIN POWER IS ON OUR KNEES! 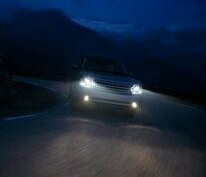 ​Darkened roadways traveled at night require headlights on HIGH BEAM. In an instant our way is light so we can avoid what otherwise could not be seen both near and far away. The risk of night travel without this option can result in catastrophe. It was a cold winter night as my family returned home from Sunday evening service at church. Asleep in the back seats of our station wagon, we were suddenly awakened by an abrupt stop accompanied by a jarring and loud clunk...we had hit a deer. With the headlights on dim, my father was unable to see clearly what was ahead – the HIGH BEAM lights weren’t on because they were not working! The darkened roadways of life require a HIGH BEAM option. It is the light of God’s Word that provides the necessary illumination to negotiate the twists and turns that come our way. Keeping our HIGH BEAMS in good working condition is the answer. Read God’s Word daily, apply God’s Word readily, and following God’s Word constantly. It is illuminating our lives with God’s Word ever at our fingertips and hidden in the fiber of our souls. PRAYER; I choose to hide your Word in my heart, dear Lord, for then the path you have laid out for me will be clear. Thank you for your guiding Word. In Jesus’ name I pray, Amen. AVOID RISK - TURN ON THE HIGH BEAM OF GOD’S WORD! ...TO ANSWER God’s call - which is above all! We are preparing to leave Horizon Christian High School as Dave retires from 51 years of coaching. Each assignment has been home for us and the bonds are strong. Now IT’S TIME to follow God’s lead and trust His plan for a new ministry adventure. ...TO SAY GOOD-BYE to the amazing Moms of Horizon Christian High School athletes, the coach’s wives and the staff where this SPORTMOM E-votional ministry began. You will be forever in our thoughts, prayers and hearts. ...TO MOVE across this great nation to another place that God has prepared for us. 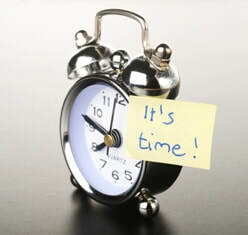 ...TO REMAIN in weekly devotional ministry both on Facebook’s SPORTMOM E-votionals and through email notifications. Thank you for remaining in Christ as faithful readers of this publication. We are blessed to serve you in this way and look forward to continuing this ministry.